Gary Thompson's controversial injury-time goal earned Notts County a draw and infuriated Rochdale. Thompson netted in the fifth minute of injury time as the Dale players stopped in the belief that substitute keeper John Lillis had been fouled. Notts led when Mike Edwards volleyed in but Dale levelled 20 seconds after the break through Ian Henderson's shot and Peter Vincenti's header made it 2-1. However, Thompson netted while Lillis was on the ground to earn a point. 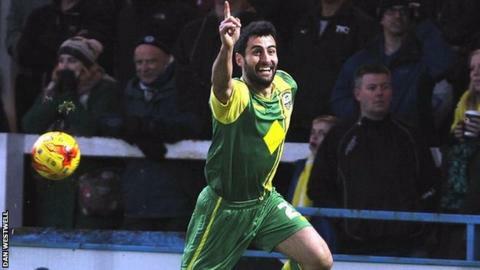 The result kept Notts in seventh place in League One, level on points with Rochdale, who remained sixth. "We competed really well, as did Rochdale. It was a really tight game, but we didn't really look after the ball this afternoon. "We kept it alive and I don't think we did that enough. We didn't get into the danger areas like we wanted to. "It's difficult to win football games at the best of times, even more so away from home, and I am disappointed with today's performance because we are better than that." Match ends, Rochdale 2, Notts County 2. Second Half ends, Rochdale 2, Notts County 2. Goal! Rochdale 2, Notts County 2. Garry Thompson (Notts County) right footed shot from the centre of the box to the bottom right corner. Matt Done (Rochdale) is shown the yellow card. Foul by Stephen Dawson (Rochdale). Drissa Traoré (Notts County) wins a free kick in the attacking half. Elliot Whitehouse (Notts County) is shown the yellow card. Stephen Dawson (Rochdale) wins a free kick in the defensive half. Foul by Elliot Whitehouse (Notts County). Corner, Rochdale. Conceded by Hayden Mullins. Michael Edwards (Notts County) wins a free kick in the attacking half. Attempt missed. Rhys Bennett (Rochdale) header from the centre of the box misses to the left. Corner, Rochdale. Conceded by Blair Adams. Corner, Rochdale. Conceded by Michael Edwards. Substitution, Rochdale. Calvin Andrew replaces Ian Henderson. Attempt saved. Elliot Whitehouse (Notts County) right footed shot from outside the box is saved in the bottom right corner. Substitution, Rochdale. Rhys Bennett replaces Peter Vincenti. Substitution, Notts County. Drissa Traoré replaces Ryan Hall. Attempt blocked. Matt Done (Rochdale) left footed shot from the left side of the box is blocked. Attempt missed. Matt Done (Rochdale) left footed shot from the left side of the box is too high. Attempt missed. Ryan Hall (Notts County) right footed shot from outside the box is high and wide to the left. Substitution, Notts County. Michael Petrasso replaces Stephen McLaughlin. Joseph Rafferty (Rochdale) is shown the yellow card. Jack O'Connell (Rochdale) wins a free kick on the left wing. Attempt missed. Garry Thompson (Notts County) right footed shot from outside the box misses to the right. Blair Adams (Notts County) wins a free kick in the defensive half. Substitution, Notts County. Ronan Murray replaces Alan Smith. Alan Smith (Notts County) wins a free kick in the defensive half. Goal! Rochdale 2, Notts County 1. Peter Vincenti (Rochdale) header from the right side of the six yard box to the top right corner. Assisted by Matt Done with a cross. Jack O'Connell (Rochdale) wins a free kick on the right wing.